I had a lovely holiday this past weekend filled with good food, good friends and some great shopping deals. I think I'm actually done with all my Christmas gift purchases which is a big relief. Now I can just relax and enjoy the season. Yesterday I was relaxing in my crafty room, straightening up and putting things away when I came to the Harvest Mouse set that I had used for this year's Thanksgiving card. 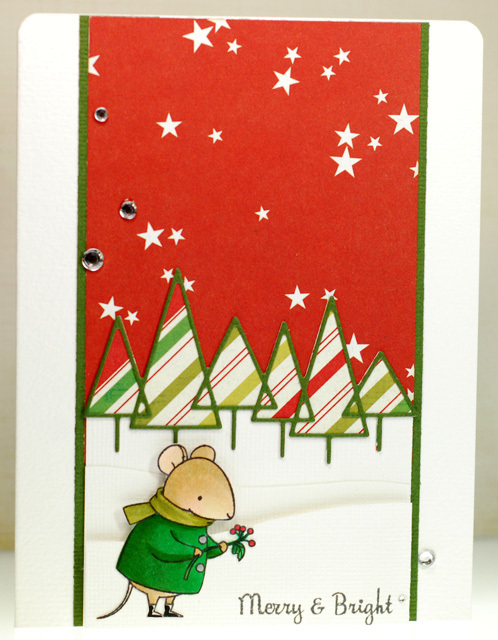 I thought that this little mouse looked like he was holding a holly branch so I decided to make him work on a Christmas card. The papers are from the Heidi Swapp Believe collection and of course I matched my Copic colors back to it. With just a little help from a Christmas tree die I had a clean and simple scene for Mr. Mouse to live in. AWE sooo very cute!!! We had a great 4 days off. Shopping is almost done and everything I have bought or made is wrapped!!! Have a GREAT week doll!!! So sweet, he does look like he is holding a holly branch. I had a great Thanksgiving too. I am giving banana bread this year so I have not started yet, the bananas are ripening right now.